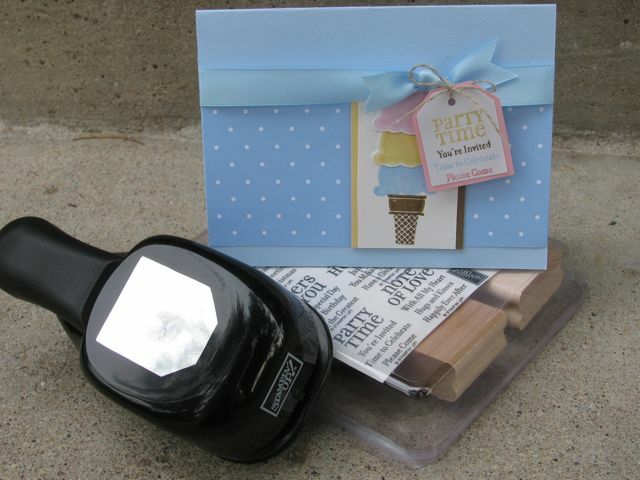 Welcome to my UTAH Ice Cream Castle along the Royal Blog Tour featuring the SWEET SCOOPS stamp set from the Stampin’ Up! Summer Mini Catalog! Confession: I have an incurable sweet tooth, and when it comes to stamps of food…I’m totally addicted! On the last blog tour, I used cupcakes, so it only follows that you need ICE CREAM with your cake, right? Did you know the average U.S. citizen consumes an average of 5 1/2 gallons of ice cream each year? 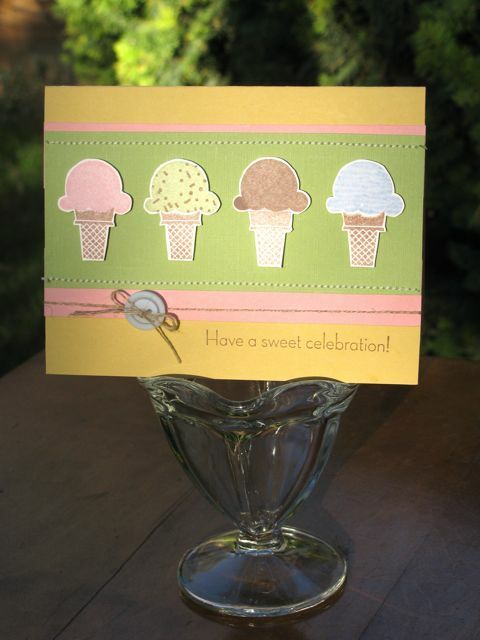 The petite size of these “cones” make perfect gift tags. More trivia: More ice cream is sold on Sunday (Sundae?) than any other day of the week! 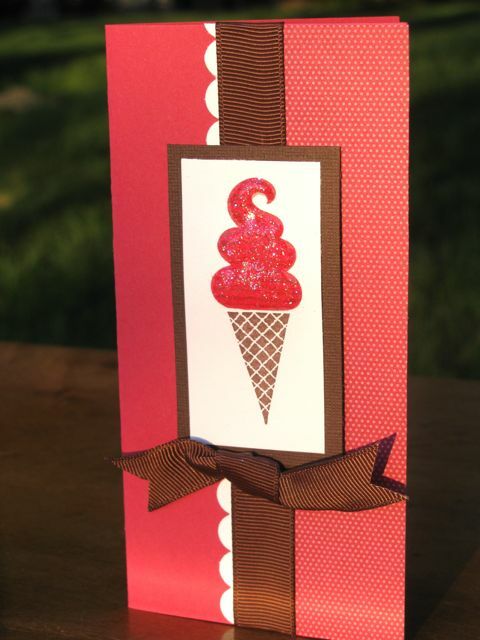 To make a “shiny” ice cream cone (like the Cherry Topper), just add Crystal Effects over your stamped image (Dazzling Diamonds glitter, optional). If you enjoyed your visit, please leave me a comment! 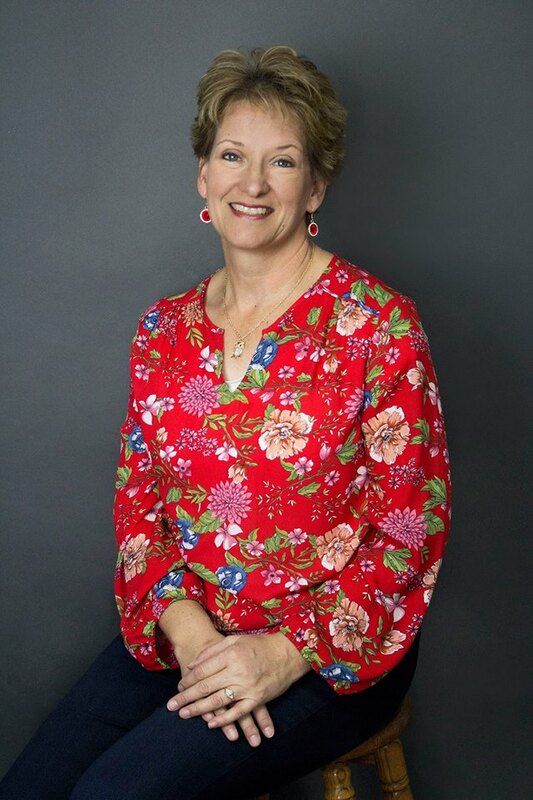 Don’t forget to collect clues along the Royal Path to enter the BIG SHOT drawing at the Royal Blog Tour homepage, and if you are ever in Utah, let’s go out for ice cream! Thanks to everyone for the kind comments, joining my newsletter and following my blog! Gosh, I guess I have to buy this stamp set now too!! Love your projects, Loni! Great projects, Loni. Makes me want to go get some ice cream! And order this set! Looks like you had a lot of fun conjuring up these sweet treats. Ok, it's only 9:30 am and I'm drooling for ice cream! Love your projects! Loni, congratulations you did a beutiful projects. Thank you for be part of this wonderful tour. 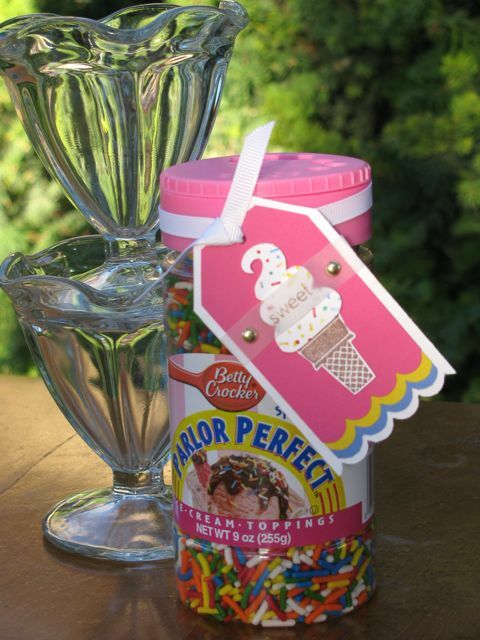 Love the ice cream scoop ideas for this summer. Great card projects. Thanks for sharing. I love the tour! I knew I would get this set as soon as I saw it and now I have a few more ideas on how to use it. And since I am in Utah, anytime you want to go out for ice cream, give me a call. I'm always up for a scoop. These are great ideas, especially the cherry one with Crystal Effects. You have come up with many uses for the ice cream. I just want to eat it! LOL! Love all your Sweet Scoops creations. Great ideas for cards. Subscribed to your blog. Love your work! I Am subscribed to your blog. Great cards! Can't wait to get this set. Thanks so much! I want some ice cream now!!! GREAT cards! Thanks for sharing your ideas….. I want my ice cream too!! Awesome job, thanks for sharing. OK, the blog right before yours was all about cupcakes . . . now the ice cream to go with the cupcakes! LOL What GREAT projects! Love everything!!! Thank you for taking the time to share your time and talent. I have a serious sweet tooth too! I so enjoyed your yummy projects and fun bits of trivia. Thanks for the chance to win your blog candy. I signed up for E-mail updates. Loni, Love your sweet shoppe! Great designs. It's good to see something new and different! Thanks for being a part of this wonderful tour! Love your projects – great inspiration for using this set. I'll be coming back often. Yummmm. Now I'm craving ice cream to eat while I finish the blog tour. Thanks for the adorable projects. How fun, I love your yummy projects! TFS! Love your projects and this is a set I didn't think I would buy, thanks for enabling me. I love all of your projects…. definetely satisfied my sweet tooth! thanks for sharing great ideas. will use some this summer for a social. So many samples, and all of them are wonderful! You did a wonderful job, and I have signed up for a steady dose of inspiration. Thanks! Subscribed to your blog and love your creative juices. Who doesn't like ice cream, especially in a cone? Enjoyed your trivia also. Cool castle in our blog tour and thanks for the blog candy offer! Loni: You've given me a whole new appreciation for ice cream cones. These are all so adorable. 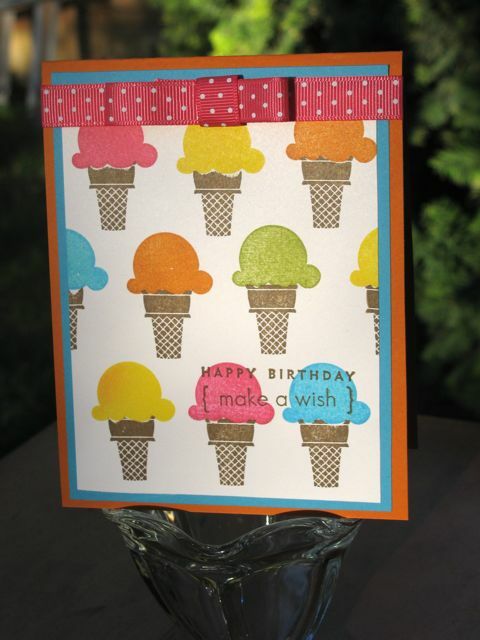 Loni, you created some awesome cards with the “ice cream cone” set. Thanks for the inspiration. Love the cards, especially the one using the set as the background. TFS! Yummy Wish I could eat ice cream. LOL Your cards are so cute. 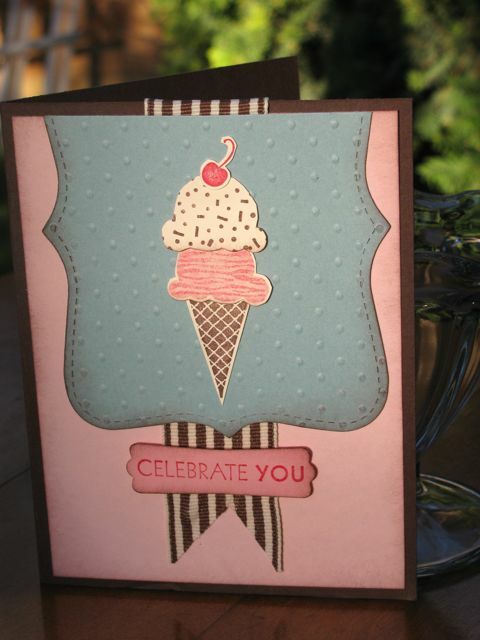 I love the chocolate striped ribbon used on one of the cards. I really feel like going out for an ice-cream sundae now! Thanks so much for your great designs, and also for the neat trivia! It was fun to read!